Have the model you just downloaded up in SketchUp. 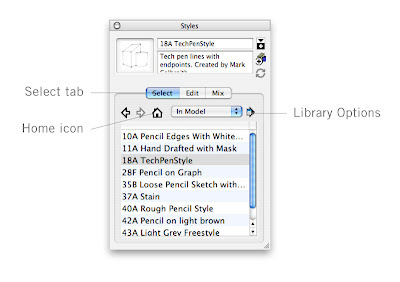 Open the Styles dialog box, choose the Select tab, and click the "Home" icon to see a list of the Styles which are applied to the model. Press the the Library Options button to open the Library Options flyout menu. Choose "Save library as...", then select a folder where you'd like to save all the Styles. Make sure to check the "Add to favorites" check box so your new Styles Library will always be available in your Styles dialog box. WOW, some of these look great!!! will they be posted on 'groups' for all to try? Great work!